The influence of Egypt is beginning to be felt. Nubian civilization is beginning to free itself from Egyptian dominance. Nubian civilization is becoming more African and less Egyptian in spirit. The kingdom of Nubia is flourishing. 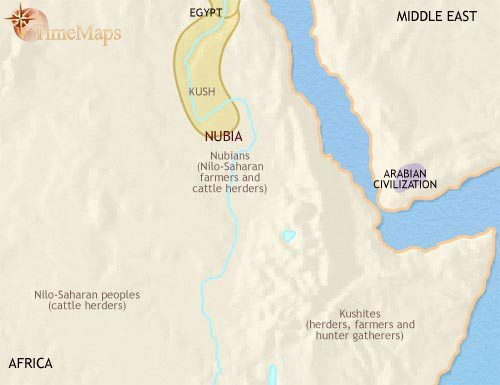 Nubian civilization is suffering from a shortage of resources. For centuries, the land of Nubia has been coming increasingly under the influence of its great northern neighbour, Egypt. When Egypt has been united and powerful, this influence has taken the form of outright conquest, at least in the north of the region. 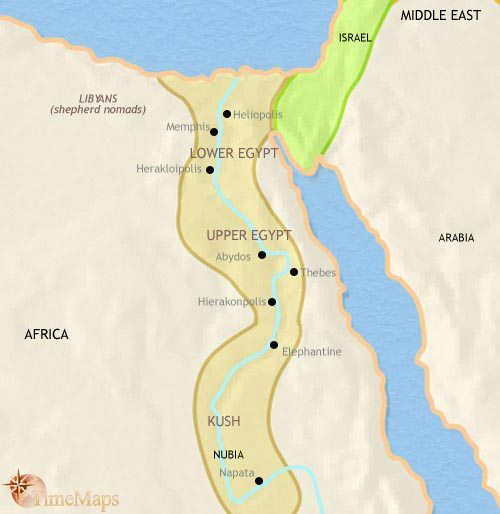 Egyptian colonies have been planted along the river Nile, and the outlying tribes, herding their cattle on the grasslands away from the river, have owed a loose allegience to the Egyptians, and traded with the Egyptian merchants in the towns. 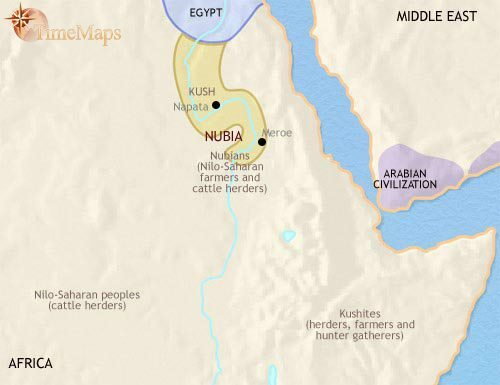 During the period of the New Kingdom in Egypt, much of Nubia came under the direct rule of the Egyptian government. Egyptian colonies, trading posts and garrisons were established, from which the Egyptians exercised a tight control over the country. The chiefs of the pastoral tribes which roamed the grasslands away from the river were given Egyptian titles and became client princes in an Egyptian-controlled system of indirect rule. A major purpose of this system was for Egypt to control the valuable mines and trade routes which ran through this region. 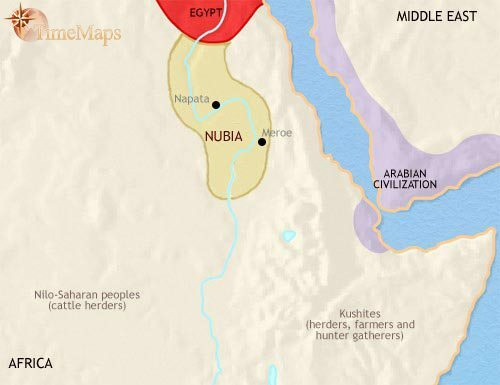 With the decline of Egyptian power in the past couple of centuries, the Egyptian ruling class has remained in place, and Nubia has become the seat of independent kings, with a court and culture very similar to that of their northern neighbours. In 730 BCE the king of Nubia conquered Egypt, founding the 25th dynasty of pharaohs. This line of Nubian pharaohs lasted for about 60 years before being driven back into Nubia by an invasion from Assyria (670 BCE). Here they have continued to rule a powerful kingdom, at first based on Napata, the old capital, and then, after 593 BCE, when Napata was sacked by an Egyptian invasion, at Meroe, in the south. The ruling class of Nubia remains notably Egyptianized. The kings continue to call themselves Lords of Upper and Lower Egypt, the traditional titles of the Egyptian pharaoh. The court continues to use the Egyptian language and script, and Egyptian gods are worshipped in the Egyptian-style temples. The move south, however, symbolizes Nubia’s growing freedom from its past as its civilization begins to develop in its own distinctive way. Meroe, the new heartland of the Nubian kingdom, is far enough south to receive tropical rains in the summer, and crops of sorghum and millet can be grown without the need for irrigation. 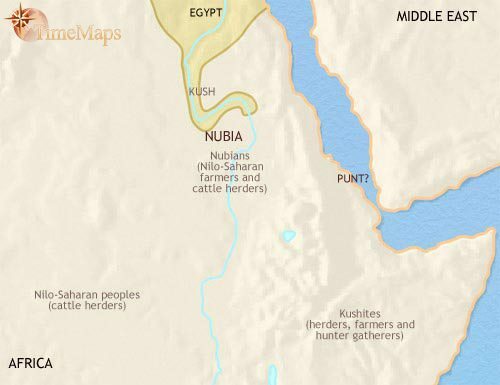 A mixed agriculture of crop-growing and cattle-rearing flourishes well beyond the near confines of the river Nile, and forms the economic base of the Nubian kingdom. In other ways, too, Nubian culture and society is moving away from Egyptian models. The local language has replaced Egyptian at court, and an alphabet (as yet undeciphered) has been developed for it. In religion, the Nubians are adding their own gods, notably the lion god, Apedemek. In art, Nubian motifs are becoming more important, with African animals playing a larger part, and in architecture, the kings are being buried under distinctive Nubian-style pyramids – centuries after the last pyramid was built in Egypt. The Red Sea trade is increasingly important as the international maritime trade between India and the west grows. Nubia’s trade goods are ivory, leopard skins, slaves, ostrich feathers, ebony and gold. The sources of this trade, hunting and mining, and the trade itself, are under the direct control of the king, and the kingdom is reaching a height of prosperity. 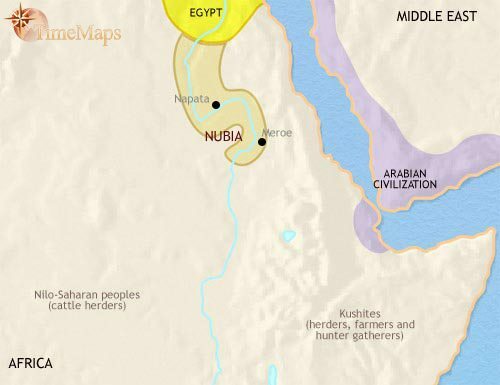 The kingdom of Nubia has retained its independence from Rome, despite a couple of Roman incursions into the country under the early Roman emperors. By now, relations are good, and trade is flourishing. The kingdom grew in power and wealth, and Nubia reached a peak of prosperity under king Netekamani (12 BCE – 12 CE). By now, however, its economy is probably in decline. 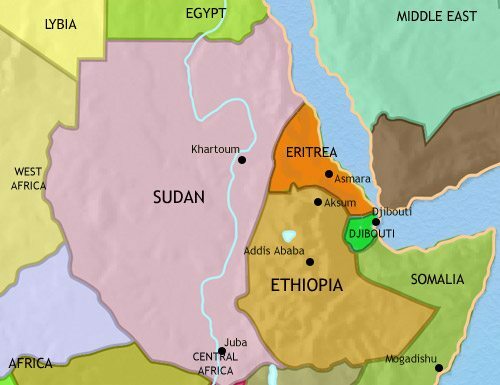 Its international trade, based on the Red Sea routes, is losing out to the rising power of Aksum. At home, deforestation, due in part to the large iron industry’s demands for wood fuel, is reducing soil fertility and undermining settled agriculture; semi-nomadic cattle herders are becoming more populous and spreading over a wider area. Also, the growing shortage of trees is affecting the iron industry itself. 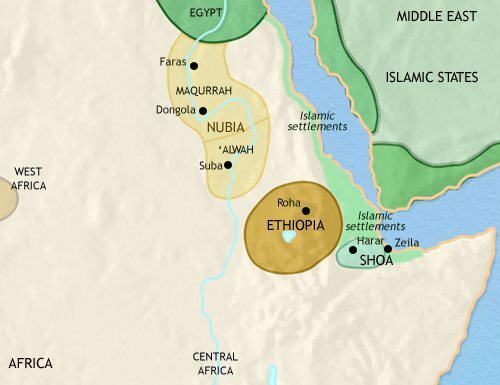 The centuries-old kingdom of Nubia has been shattered by a strong invasion from the Axumite kingdom of Ethiopia; it has fragmented into three parts, Nobatia, Maqurrah and Alwah. In Ethiopia, the kingdom of Aksum has become a powerful state. It has also become a Christian one, converted by monks from the Byzantine empire. Ethiopian Christianity is centred around monasteries, which will play an enormous part in the cultural and political life of the country. Shortly after this time, the Ethiopians briefly control the south-western parts of the Arabian peninsula, before being driven back across the Red Sea by the Persians. Aksum, and its port Adulis, on the Red Sea coast, are flourishing centres of trade; at this time Aksum apparently dominated the maritime trade coming up the Red Sea from India and the East. The Nubian states had all become Christian by the early 7th century. The two Nubian kingdoms (Nobatia was conquered by Maqurrah sometime in the 7th century) are home to a lively Christian civilization of towns and villages, monasteries, churches and palaces. 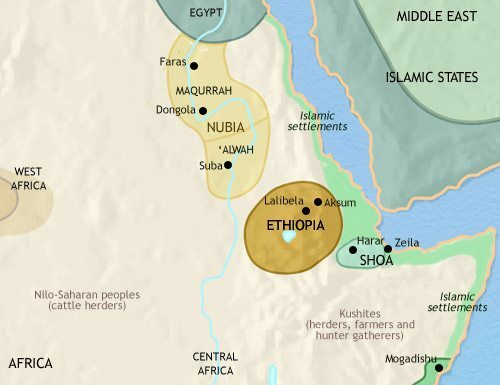 By the mid-8th century, Ethiopia is in decline. Her once flourishing trade is being strangled by the rising tide of Islamic commerce; the seas and coasts have become a hostile environment to this Christian people. It is also possible that over-grazing and soil erosion were reducing the prosperity of the central core of the kingdom. 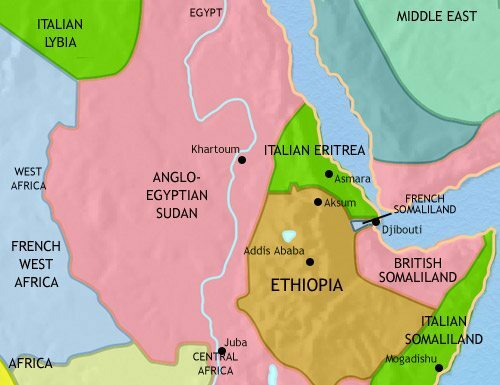 As a result of these factors, the focus of Ethiopian society has shifted south, further into the central highlands. 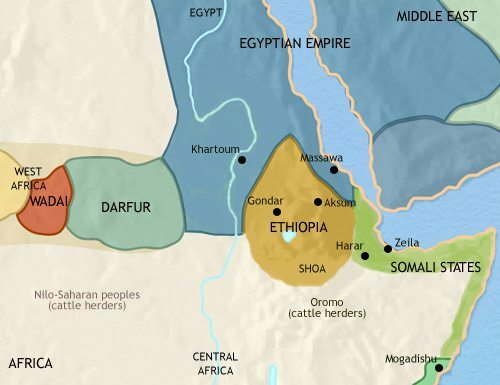 This development has increased the isolation of Ethiopian civilization. 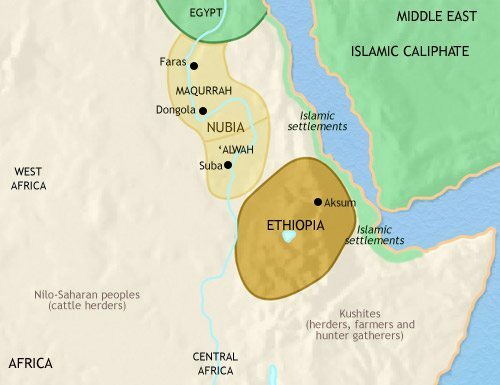 The Christian kingdoms in Nubia and Ethiopia have become increasingly isolated outposts of Christianity, entirely cut off from other Christian nations by Muslim territory. In Ethiopia, the inhabitants also face fierce and unrelenting pressure from the pagan peoples on their southern borders. Within Ethiopia, a powerful landed aristocracy owns most of the land and controls the lives of the peasantry. 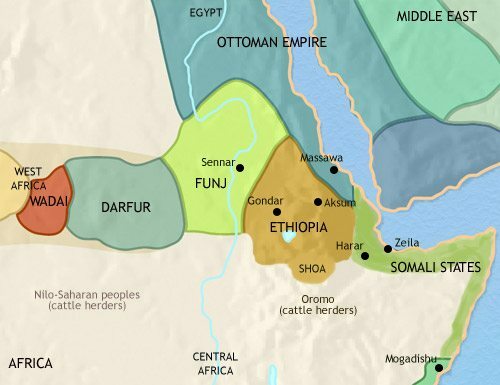 In the 11th century Ethiopia experienced intense political instability. In one incident, a princess murdered all the royal family – except the infant king, who was smuggled out of harm’s way. Shortly after this shock, a new line of kings, the Zagwe, took power from the old Aksumite line. They have firmly established their power in the country. They are centralizing their authority by replacing traditional tribal rulers – who owed only a loose allegiance to the king – with royal governors appointed by themselves. Economically, Ethiopia’s fortunes have risen. With economic revival in Egypt has come expansion for Ethiopia’s trade: the country is one of the major sources of frankincense and myrrh, two spices much in demand in the Muslim world, and it also exports slaves to the north. The current king, Lalibela (c. 1200-1250), is famous for building a series of unique churches hewn out of solid rock near his capital (also now named Lalibela). 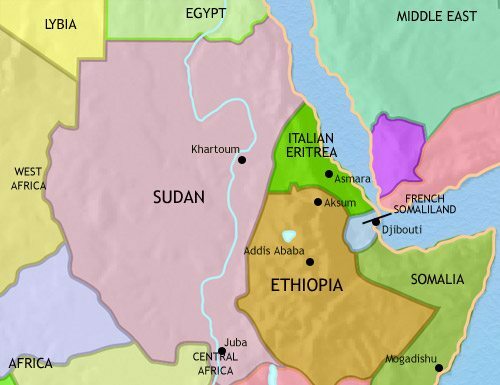 A strong Muslim state has developed to the south-east of Ethiopia, based on trading posts from which control over the local population has gradually been achieved. In the early 14th century the Christian Nubian kingdom of Maqurrah was overwhelmed by the inflow of Arab tribes, ejected from Egypt by its Mamluqs rulers. The conversion of Dongola cathedral into a mosque (1317) symbolized this process. These tribes have continued migrating south and west, pushed on by the expanding power of the Mamluqs to the north. Under the Zagwe kings, the Ethiopian empire expanded, its formidable army winning territory from the surrounding pagan tribes. 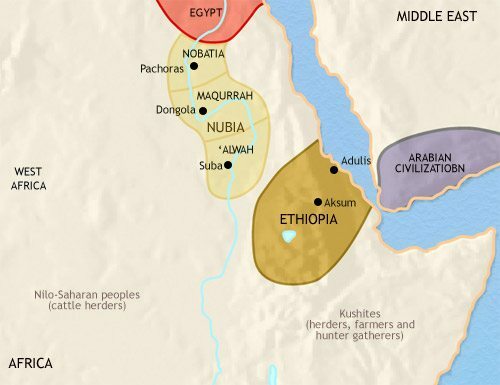 Christian Ethiopian colonists were planted in the newly-conquered lands, and new monasteries founded in these areas, bringing with them Ethiopian culture. In 1270, however, the Zagwe line was replaced by the Solomonid dynasty. 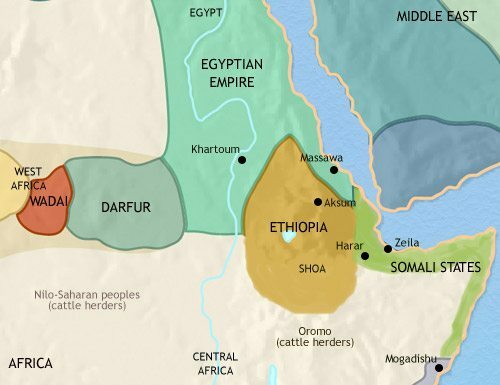 A new, militant Muslim state, the sultanate of Adal, has become the centre of Muslim expansion in the region, spreading the faith amongst the Somali pastoral tribes. This period has seen a gradual escalation of fighting between the Muslims, and by now the two powers are in a state of near-constant warfare. A pastoral people of the eastern savannah, the Funj, have conquered a large kingdom in the Sudan. At this time they are converting to Islam. The Ottoman empire has occupied northern Nubia as well as some of the Red Sea coast. During the 16th century royal authority in Ethiopia was weakened by the growing regional power of governors, who are, by now, virtually independent princes within their domains. Then Adal, with a force armed with firearms acquired from the Turks, attacked the Christian kingdom, shattering what remained of its cohesion. The Ethiopian emperor appealed to the Portuguese, who sent a small army and, together, the Portuguese and Ethiopians managed to defeat Adal’s forces. The Ethiopians went on to recover most of the territory they had lost. Meanwhile, the Oromo people were moving into the country from the south. They are cattle herders who, in search of new grazing lands, are taking over the areas no longer controlled effectively by either Christian or Muslim rulers. 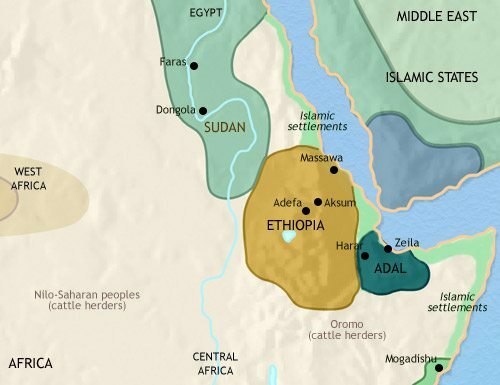 The southern halves of Ethiopia and Adal were soon overrun by the Oromo. 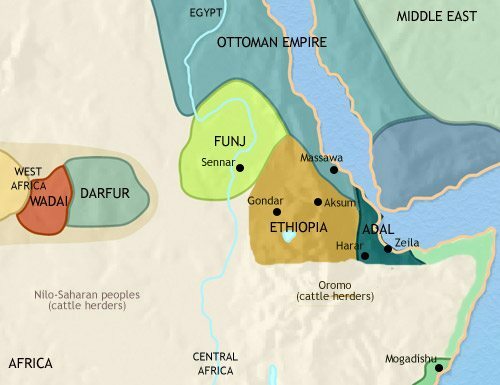 With effective royal power now confined to an area around their capital of Gondar, the Ethiopia emperors can do little to stem the Oromo tide.